It's funny what a win can do to the confidence of a basketball team. Losing 5 of their last 6 games, including their last 3 games, the Fighting Illini traveled to Lincoln, Nebraska this past Tuesday night to get back on the winning track, at least for the time being. D. J. Richardson regained his shooting touch, scoring a career high 30 points to help lead the Illini to a much needed lopsided victory. It seems forever and a day ago since the Illini were thoroughly embarrassed in Lincoln last season, and if that wasn't the beginning of the end for Bruce Weber and the 2011-12 Illini team, then it led to that. This version of the Illini have proved that they can play with the best of the best, and also lose to the not so fortunate. Which puts the game on Sunday into the category of not knowing what will happen. The Illini will battle #2 Michigan on Sunday (5:00 pm, CT, BTN), and even though the Wolverines come in as perhaps the cream of the crop in the Big Ten, the Illini have proven before that they can step up in the big games (see Butler, Gonzaga and Ohio State). Michigan has a lot to play for as well, because if they can get past the Illini, they will become the nation's #1 team when the new poll is released on Monday. But first things first, they have to come into Champaign and get a win. The Illini's next 5 games proves to be a brutal stretch, as they will face 4 teams that are in the top 25 and a fifth, Wisconsin, who may enter the poll after knocking off #12 Minnesota on Saturday. Everyone knew that the Big Ten would be dog-eat-dog this season, and it is proving to be just that. Coach John Groce doesn't want to look past Michigan in this next stretch of games, but that doesn't mean that the members of the media (which I am among the throngs) can't. A game at Michigan State (ranked #13) looms next for the Illini on Thursday night, followed by a return to the Assembly Hall a week from Sunday to battle Wisconsin, the first team that the Illini will see for the second time this season. After that, Indiana (ranked #7) comes to Champaign, and then the Illini will travel to Minneapolis to battle the Minnesota Golden Gophers (ranked #12 before losing to Wisconsin) the Sunday after. If that doesn't speak volumes over a key few games that might make or break their season, then I don't know what does. After all, everyone knew that this wouldn't be easy, and the Illini have proven that they can beat anyone on any given night. The Fighting Illini women's basketball team has found success on the road in the Big 10 this season pretty satisfying. However, playing at home hasn't been so easy for Matt Bollant's squad. Case in point: The Illini defeated Nebraska in Lincoln 62-52 to win their third straight away from the Assembly Hall, but in coming back to play in front of the home fans against Northwestern, lost 62-58 to drop their third consecutive home game. The Illini (10-8 overall, 3-3 in the Big Ten) hope to continue their success on the road on Monday evening when they travel to Minnesota to battle the Golden Gophers (13-6 overall, 2-3 in the Big Ten). So far Bollant has not disappointed in getting this team to play well for him, and it will be even more interesting to see what he can do when he gets his own players here. The coaching carousel for the football team continued last week when Jim Bridge was hired from North Carolina State to take over the offensive line, a position that was vacated when Luke Butkus left to join former boss Ron Turner, who was hired as head coach at Florida International. Butkus, who claimed that Illinois was his dream job for coaching, evidently woke up and realized that the grass may be greener elsewhere. More power to him, and I wish him the best of luck. Luke is a good guy and will succeed wherever he goes. Word also came down on Saturday that defensive line coach Keith Gilmore is leaving Illinois to be reunited with his former coach Vic Koenning at North Carolina. That will once again leave another position to fill on the staff, one that Coach Tim Beckman will no doubt fill pretty quickly. With national letter of intent signing day approaching on February 6th, they will need to make a move and fast. Stay tuned. Haven't we seen this story unfold before? The Fighting Illini get out to a fast start to the season, just to watch it all unravel during the Big Ten portion of the season. Oh wait, that was just last year, wasn't it? Well, the Illini are once again seeing their season derail, only this time it is more of a rapid fall than it was last season. Wins over Butler, Gonzaga and Ohio State seem like a distant memory, and one can only wonder what has happened to the team that made Illini Nation once again proud to wear the Orange and Blue. I have a few observations on what might be happening, and if you will indulge me for a minute, I will give you my thoughts. First of all, let us remember that this is still the players that Bruce Weber recruited to Illinois, and minus Meyers Leonard, is the same team that tanked down the stretch last season, losing 12 out of their final 14 games, and which ultimately led to Weber's firing at the end of the season. One can point to the Purdue game last season as the turning point of the season, but it started much earlier than that. The last game that the Illini played well in was a 79-74 upset of then #5 Ohio State, the game that Brandon Paul scored 43 points in. To make a point here, the Illini defeated the Buckeyes, who were once again ranked in the top ten 74-55, and things were looking good around Illini Nation. But then came Minnesota, which was an expected loss, as was the game at Wisconsin. The Illini looked very lethargic in Madison, getting down 14-0 out of the gate and never fully recovered, losing badly 74-51. Wondering how they would respond to the Wisconsin loss, Coach John Groce tried to avoid any discussion that the team was losing focus and thinking about what happened last year. Then came Northwestern, who was without their two best players, so you figured it was an easy win. You figured wrong, as the Illini came out looking much like they did against the Badgers, losing at home in stunning fashion 68-54. The loss has changed expectations once again, and a team that looked like it was headed to the NCAA Tournament now may in fact be NIT bound, and that is a stretch now. I say this because the next game on the schedule, Nebraska (Tues. Jan. 22, 7:30 pm CT, BTN) lurks, and we all know what happened last year when the Illini traveled to Lincoln. Yep, you guessed it, an embarrassing loss 80-57 that pretty much drove the final nails in the Weber regime in Champaign. One can hope that the Illini will find a way to bounce back against the Cornhuskers, but after that game, the schedule gets really tough. I've said it before and I'll say it again, the Big Ten is going to be a roller coaster ride this season, but the Illini need to jump on the ride and stop watching it go by again and again. This team doesn't have much talent. After Paul, the Illini are just a bunch of bit role players that may or may not be Big Ten caliber. Again, a Weber problem that Groce has had to deal with. Guys like Tyler Griffey, D. J. Richardson and Tracy Abrams have had their moments as Illini players, but they cannot bring it consistently night after night. Then there are guys like Mike Shaw, Myke Henry and Devin Langford, who have all been given their chance at one time or another, but haven't been able to do it on a regular basis. Knowing he had no true point guard coming into the season, Groce has tried to mold Abrams or Paul into that role, but has had limited success at it. The recruits that he has coming next season might be able to fill the role, but at this time it is just too early to tell. After starting out the season at 12-0, the Illini now have lost 4 out of their last 5 games and now stand at 14-5 overall, but sinking rapidly in the Big Ten at 1-3. Grab a life preserver! Better things are happening with Matt Bollant and the women's basketball team, as they have won 3 out of their last 4 games, including 2 in a row on the road for the first time in a few years. The Illini stand at 10-7 overall and 3-2 in the Big Ten and are coming off a 62-52 win over Nebraska on Thursday night in Lincoln, behind 19 points by Adrienne GodBold, and yet another double-double by Karisma Penn, who had 12 points and 18 rebounds. The Illini will return home to the Assembly Hall on Sunday afternoon when they welcome the Northwestern Wildcats to Champaign (2:00 pm CT, No TV). With the way that the women are playing as of late, we may very well be talking about them playing in March, and not the men. The Matt Bollant era is off to a successful start, and it only should get better once he gets his own players to campus. Since it is the off-season for Illini football, it doesn't mean that they are not in the news. The rumors were true about Bill Cubit being named the new offensive coordinator, replacing Chris Beatty, who was fired last month. Cubit comes to Illinois from Western Michigan, where he was fired after the season in 2012. Cubit led the Broncos to wins over several Big Ten schools during his tenure in Kalamazoo, including a win over the Illini in 2008 at Ford Field in Detroit. He knows the conference rather well, and should be a breath of fresh air for a team that saw a disastrous end to the end of their season. I'm seeing a trend here. The Big Ten race....Dog Eat Dog? I will repeat once again, it will be tough to win on the road in the Big 10 this season. If you don't believe that, just ask Ohio State and Michigan State, two of the teams that always seem to find themselves in the thick of the conference race each season. After a somewhat unexpected loss to open the Big Ten season at Purdue, the Fighting Illini returned home on Saturday afternoon to face an Ohio State program that was ranked in the top 10. Once the dust settled, the Illini came away with a 74-55 upset win in a game that they led from start from finish. The Illini dominated the game, and at one point led by 25 points before the Buckeyes made a small push towards the end of the contest. This is not the most talented Ohio State team that Thad Matta has had in Columbus, and the Illini exposed quite a few weaknesses in their lineup. It is evident that the Buckeyes are missing guys like William Buford and Jared Sullinger, who were very strong last season. Ohio State's Deshaun Thomas ended up with 24 points, but had to take 21 shots in order to reach that total. A very bright spot for the Illini was the play of sophomore center Nnanna Egwu, who scored a career high 16 points. Egwu was taking shots that he normally would pass up, and the results were very encouraging. After the loss at Purdue, there was talk of the Illini possibly getting out to an 0-4 start in the Big Ten, but the win over Ohio State has renewed optimism of a better start than that. But, keep in mind, that it will be tough to win on the road in league play this year, and with so many teams in the top 20 this season, any win is considered a quality one. The schedule doesn't get any easier for the Illini this week, as they welcome the #8 Minnesota Golden Gophers on Wednesday night (8:00 pm CT, BTN). The Gophers present severe matchup problems for the Illini, more so than Ohio State did. Led by big man Trevor Mbakwe and sharpshooting guard Austin Hollins, Minnesota is out to a 14-1 start, including a 2-0 mark in the Big Ten. However, both conference wins came at home, so the Gophers have not experienced the road in the conference yet. The Illini, who come into the game with Minnesota ranked #12 this week, are 14-2 overall and 1-1 in Big Ten play. Better buckle up, because this should be quite a ride! Don't look now, but Matt Bollant is trying everything he can to make the Fighting Illini women's basketball relevant sooner rather than later. The latest example of this was a 79-74 win over #24 Ohio State on Sunday afternoon at Value City Arena in Columbus, breaking the Buckeyes' 31 game home court winning streak. Karisma Penn once again was the story for the Illini, scoring 34 points and grabbing 12 rebounds. Penn, who reaped Big Ten player of the week honors for the second straight time, is taking care of things on the court, and the Illini, who are 8-6 overall and 1-1 in the Big Ten, received four votes in this week's Associated Press poll, the first time they have been relevant in any poll since 2009 (they were last ranked in 2000). The Illini head to Evanston to battle the Northwestern Wildcats (8-7, 0-2) on Thursday evening (7:00 pm CT, No TV). The Illini's annual "Pack The Hall" promotion will be Sunday afternoon when they host Michigan State at the Assembly Hall (3:00 pm CT). If you are able to, get out and see this team play, because I have a feeling that Bollant will have this team playing at a competitive level sooner rather than later. That is refreshing news. Some football news came down last week, when offensive coordinator Chris Beatty was let go by Tim Beckman after only 1 year on the job. The Illini finished near the bottom in several statistical categories, leading to the change. Apparently, Bill Cubit, who was fired at Western Michigan last month, will be taking over the OC duties, although no formal announcement can be made until early next week. This will undoubtedly change some roles on the offensive staff, as Billy Gonzales moves to coach the receivers. There could be additional changes coming as well, as the weeks lead up to spring practice. Stay tuned. It's amazing how some things can turn so fast. Minutes after the #11 ranked Fighting Illini's 68-61 loss to Purdue on Wednesday night in West Lafayette, members of Illini Nation were quick to point out all of the glaring weaknesses of their beloved, and in the process, signaling out coach John Groce as not having the team mentally prepared for the task at hand. After all, the Illini were supposed to beat the Boilermakers for the first time in eight tries, but there is something about Purdue and their hold on the Illini, and it just doesn't end at men's basketball. 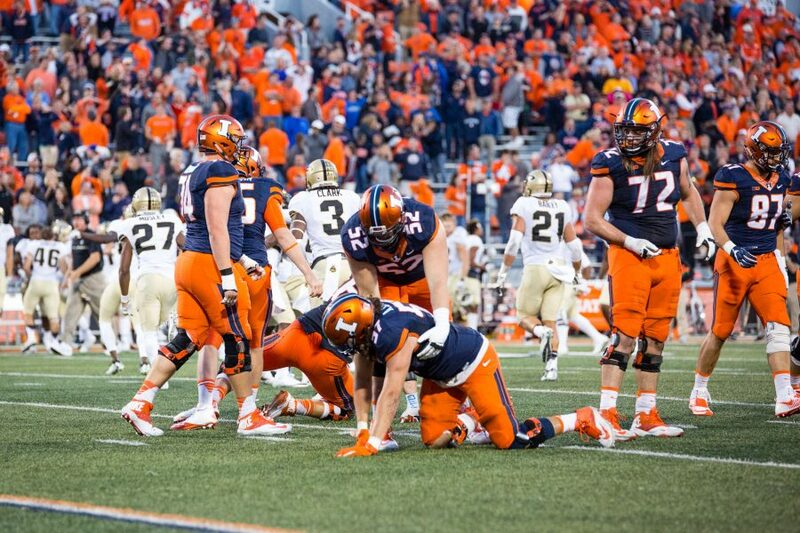 The football team has lost six out of the last seven games to Purdue, and the women's basketball team has dropped eight of the last nine games, including another heart breaker this year, the second straight loss that has befallen the Illini in this fashion. Such dominance is puzzling, and the Illini are trying anything that they can think of to break the stranglehold that the Boilermakers have over them. The loss to the Boilermakers dropped the Illini record to 13-2, so you ask what the big deal is? Remember that this is Illini Nation that we are talking about, and that the temperment of the fan base can change at a moment's notice. Everyone knew that the Big Ten would be very tough this season, but this was a Purdue team that was supposed to be rebuilding, and the Illini had the matchup advantage. This is what is tough to swallow for the Illini fan base, and even though they had a chance to run away and hide with the victory, they couldn't control the edge in rebounding and toughness, and ended up dropping the game. That being said, Groce said at his press conference to preview the Ohio State game on Saturday (1:15 pm CT, BTN) that the practice on Thursday was not intended for the meek. What he meant by that, according to guard Brandon Paul, was that is was a physical practice with a lot of rebounding drills. The Buckeyes, who are currently ranked #8 in the nation, come into the game with the Illini at 11-2 overall, and won their conference opener in Columbus over the Nebraska Cornhuskers on Thursday night. The relationship between Groce and Ohio State coach Thad Matta goes back a long ways, as far back as when Groce was in high school in Decatur, Indiana. Groce's high school coach was Todd Lickliter, who would later coach Matta at Butler University. When Matta became the coach at Butler, he had Groce as an assistant and later brought him to Columbus with him. Groce has never coached against Matta in a regular season game, and doesn't really play up the fact that the two are good friends. "When the ball goes up in the air, both he (Matta) and I will be focused on the game and all that other stuff will take a back seat", Groce said of coaching against him. Regardless of how the game against the Buckeyes turns out, the Illini know that they have to control the boards, something that just hasn't been happening. Fresh off of his first major upset over a top 10 team, Coach Matt Bollant has his Fighting Illini women's basketball team playing some competitive basketball. Coming into the game with #6 Georgia last Friday night at the Assembly Hall in Champaign, the Illini knew that they were in for a battle. Karisma Penn realized that, and responded with a monster game, scoring 27 points and grabbing 19 rebounds to help lead the Illini to a 70-59 upset over the Bulldogs. Big Ten play began earlier this week at home against nemesis Purdue, a team that defeated the Illini a year ago on a three-pointer at the buzzer. Thinking lightning couldn't strike again, the Illini played the Boilers tough, but once again fell to #14 Purdue 67-66 in overtime. Adrienne GodBold returned to action with a double-double, scoring 20 points and snaring 11 rebounds. A last second shot by Kersten Magrum fell short, sending the Illini (7-6, 0-1) to defeat. The Illini will travel to Columbus, Ohio on Sunday to face the Buckeyes (1:00 pm CT, No TV).